Here is your chance to own a piece of history in the quaint lumber town of McCloud, California. 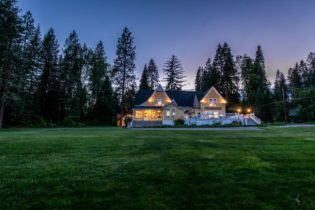 The beautiful McCloud River Inn is for sale. Here is your chance to own a piece of history in the quaint lumber town of McCloud, California. Built in 1903, the McCloud River Inn housed the former headquarters for the McCloud River Lumber Company, McCloud’s first bank, and the local Telephone Switchboard. In 1990, the McCloud River Inn received its historic designation by the State Office of Historic Preservation. Currently operating as a Bed and Breakfast, this charming property boasts 5 unique guest rooms, several retail/office space rental opportunities, an innkeeper’s apartment, a large event/conference room, lush landscaping, a beautiful sun deck, large storage unit/garage space, and plenty of room on the beautifully groomed grounds for weddings or events. Several old bank vaults, safety deposit boxes, and even an old phone booth make up some of the historic features you’ll find within the building. The Inn is within walking distance of historic Main Street in McCloud, where you will find restaurants and shops and numerous local events. Enjoy endless recreational opportunities including hiking, boating, fishing, skiing, and so much more. Take in all of the historic beauty and great income potential that the McCloud River Inn has to offer. Call for more details and a historic tour of this incredible property. This property was built by the Benbough family in the early 1930’s as their Country Home. The Benboughs were one of the founding families who resided in Old Town San Diego. The family took the long drive out to their country home every summer. Mr. Benbough was the Mayor of San Diego at one time. In addition, the family owned furniture stores, grocery stores, meat packing plants, nurseries, etc… The original home was only three bedrooms but the Estate enjoyed 20 all usable acres, a 2 bedroom guest house, a full barn & paddocks. In fact, the family was able to ride their horses from the property straight to the Del Mar beaches. Over the years, the house grew. The family was good friends of Golden Construction who was one of the premier builders of commercial buildings. The family employed Golden Construction to remodel the home all the way up to the 1980’s which included additions to the original home. It seemed that every time the family came back from Europe with major antiques, a new addition was added to accommodate these antiques. This evident in the game room where the wet bar has glass cupboards from the original post office box piece. Additionally, the fireplace mantle in the downstairs dining room is an antique from Germany – an antique headboard. There are antiques incorporated into the Estate if you just look. The Estate became a week-end playground for the Rich & Famous through the 1970’s when Leglar Benbough, the last Benbough, owned it. It was not at all uncommon for the “Duke”, John Wayne, Bing Crosby, Rex Harrison, Betty Davis to name a few to spend the weekend away from Hollywood to relax at the Ranch. Wonderland Ranch has it’s own entrance for each room and independent locks so the design of the property from a floor plan perspective is well suited for a Bed & Breakfast. 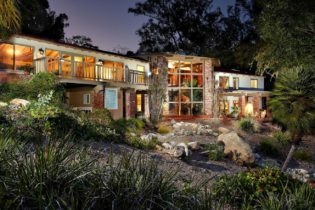 Expansive 5.37 acres in Rancho Sante Fe (San Diego CA).